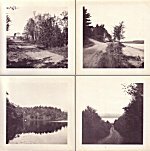 4" x 7" - State of Maine Views - C.S. Gurney, Mechanic Falls, ME. "Ricker's Hotel Poland Springs"
6.5" x 9.5" - Mounted on cardboard"
3.5" x 7" - Strohmeyer & Wyman, Publishers, New York, NY "
3.25" x 4" - A.T. Thompson & Co., Manufacturers, 26 Bromfield St, Boston, Mass. 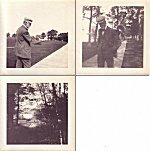 8.5" x 5.25" - C. P. Hibbard, Photographer, Lisbon, N. H.
11" x 14" - Henry William "Harry" Vardon (9 May 1870 � 20 March 1937) golfing at Poland Spring. 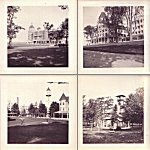 1905 (ca) - Central tower of PSH, putting green, guests, etc. 8" x 10" - Stamped on back "Currier, Poland, Maine"
4.5" x 2.75" - "Blondy the Bellhop joined Phil the clerk." 2.75" x 4.5" - "Mickey and I. In our mourning. Mickey a U of Me Senior Class Student. I had my first hair cut styled bob with bangs." 2.75" x 4.5" - "Me in my working garb in front of Poland Hotel. Person snapped us was governess to boy pictured." 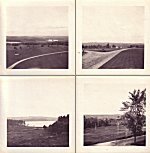 2.75" x 4.5" - "All are waitresses of summer of 1931"
2.75" x 4.5" - "Madge - Poland Maine"
2.75" x 4.5" - "George, one of the caddy boys. Poland Me." 8" x 10" - "AT THE INTERNATIONAL DOG DERBY - Mrs. Ted (Peg) Ricker, the only woman entered as a driver in the derby, at the opening day's races of the International Dog Derby held at Poland Springs, Maine." 6.5" x 8.5" - "AT THE INTERNATIONAL DOG DERBY - Mrs. Ted Ricker, only woman driver entered in the race, and her lead dog "Sport", at the start of the International Dog Derby held at Poland Springs, Maine." 8" x 10" - "WILL VIE FOR FIRST PLACE HONORS IN POLAND SPRINGS, MAINE DOG DERBY - POLAND SPRINGS, Maine - PHOTO SHOWS - Mrs. E.P. Ricker, who won second place in the Lake Placid Dog Derby, recently and Leonhard Seppala first place winner, who will vie for first place honors in the forthcoming Dog derby here." 8" x 10" - "WINNER OF SLED RACES AT POLAND SPRINGS - Ike Lagasse of Littleton, N.H., who won the first day's races at the dogsled derby held at Poland Springs, Maine." 8" x 10" - "AT THE POLAND SPRINGS DOG TEAM RACES - Leonard Seppala finishing second in the 25-mile race on the snow-covered course at Poland Springs, Me. Feb 7 1930"
29.25" x 10.25" - "From R. T. Reed. July 25, 1937. / Remember Me." "Historical occasion - Colonial ceremony marks 125th anniversary of founding of Poland Springs, Maine, famous sports and vacation center. Penobscot chief Needabeh offers refreshments to Wentworth Ricker, toen oldster, in birth bark cup." 10" x 18" - "photo by Verrill - Poland Spring Studio"
8" x 10" - "Poland Spring, Maine...Mel Parnell, Red Sox great, receives royal welcome at the Poland Spring Hotel as he arrives in old fashioned Pung, driven by host, Saul Feldman, executive director, as Mrs. Loren Feldman, hostess, extends a warm handshake to the famed southpaw." 8" x 10" - "LEWISTON, Me., May 24 - HE'S THE CHALLENGER - Spectators watch through window as Sonny Liston would up training at Poland Spring near Lewiston yeaterday. 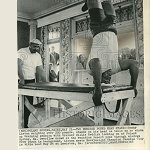 Liston, former heavyweight champion, hopes to wrest title from Cassius Clay in bout in Lewiston tomorow night, (AP Wirephoto)(tdll 20600stf)1965"
8" x 10" - "POLAND SPRING, MAINE, May 21 - TWO HUNDRED POUND HEADSTAND - Sonny Liston weighing over 200 pounds, stands on his head on table as he winds up training session with trainer Willie Reddish looking on at Poland Spring, Me. Overflow crowd at the vacation resort peek through windows from porch in background. Liston meets Heavyweight Champion Cassius Clay in title bout May 25 at Lewiston, Me. 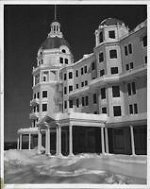 (APWIREPHOTO)(jdk61220fcc)65"
8" x 10" - "LUXURY HOTEL READY FOR WAR ON POVERTY - An army of 1,080 young women will begin arriving at the Poland Spring Hotel in Poland Spring, Maine, in the hills of central Maine this April to begin life a few of them have ever known--in the 600-room hotel that has catered to the wealthy for generations. The Job Corps training center will be the largest of its kind for underprivileged women in the United States. Like vacationers, they will swim, play tennis and golf, ski and skate and drink spring mineral water on the sprawling 5,000-acre resort. They will be taught several different trades also." 8" x 10" - "(BX1)AP-042601-4/26/66-Poland Spring, Maine -- Dr. Bennetta Washington, 3rd from le[ft w]as on hand here at the nation's newest and largest women's job corps center, [and w]elcomes the first of some 1000 girls to gather and train here.. Officials at [the c]enter requested news media to remain at least 10 feet away from the girls as [t]hey arrived, so as not to upset the new arrivals. with photos or interviews. [A]ll of the new arrivals will go,through a one week indoctrination course with [m]edical and dental checks... U P I Telephoto"
8" x 10" - "(BX1)POLAND SPRING, Me., April 27-- EARLY ARRIVALS--The first group of Women's Job Corps enrollees arrived at the fashionable Poland Spring Hotel Tuesday. The former resort will be transformed into the largest center of its kind for underprivileged women. The trainees will be housed in the main hotel (background), built in 1876. (AP WIREPHOTO) (bd32250stf-fcc) 1966"
8" x 10" - "(AUG2) POLAND SPRING, MAINE, June 14--SPRING UNDER GLASS--Ernest Bilodeau, manager of the Poland Spring bottling plant, Poland Spring, (Maine), points to where the pure mineral water spring seeps through the granite bedrockand is enclosed under the glass dome. Mineral water from the spring has been bottled and distributed throughout the world since 1845. (AP Laserphoto) (Jru50600str/john martell) 1979"
7.75" x 9.75" - "Is that a bottle of Poland Spring in your pocket or are you just glad to see me?""